Ask fellow campers about "Harbor Cove RV Resort" and nearby attractions. Located in an industrial park, which didn't affect our stay at all. Harbor Cove it a very nice campground with awesome water views. It's a relatively new campground, and surprising to see it was only 10% occupied during our stay. However, calling it a "Resort" is a stretch. 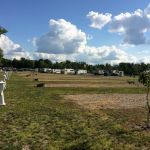 Only a few of the seasonal sites have concrete pads, There's no cable, there are no activities, even though they advertise a pot luck dinner and "Great food" from proprietors Marty & Rose of Charlie's Pride BBQ and Catering, which was never open. Oh, and bring a fly swatter. You'll get a workout. 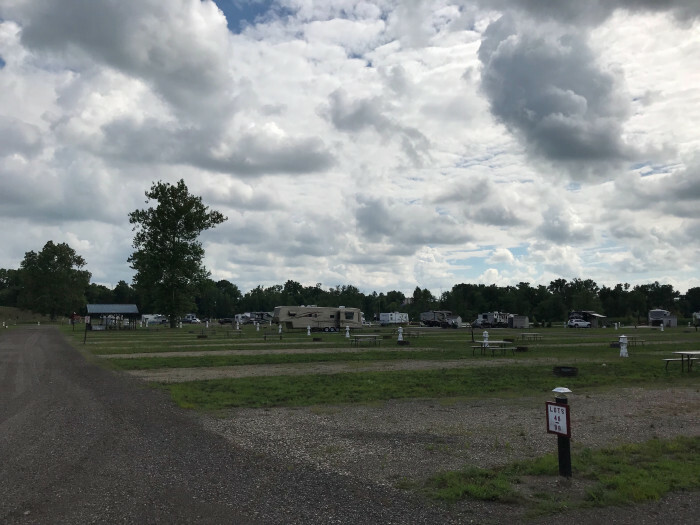 All in all, with the view, and a few improvements, this campground can easily become a "Resort". The way it is now, it is still way better than some of the places we've stayed recently, and we would stay here again if we are in the area . We camped at Harbor Cove RV Resort in a Motorhome. Coldwater is a small town with friendly people. Lots of shopping and restaurants. My husband and I had reserved a lot on the lake. We drove 3 hours to get there, when we arrived they said they double booked the site so we didn't get the lake view we had paid for. They did give us the difference back. I also took my grandson to get icecream which she had just put away, it was 12 noon :(. No trees, beach was ok, boat rentals were taken not the best trip!! We camped at Harbor Cove RV Resort in a Travel Trailer. A relatively new lakeside park that's working well to build a great destination. Very helpful staff. Gated entry with nice gravel roads & wide, level sites but very few with any shade. No cable yet but easy to get satellite signals. A boat launch inside the park and docks along with a sandy beach & volleyball. As the park gets busier some of the sites will become difficult for entry/exit as they are designed at 90 degree angles. 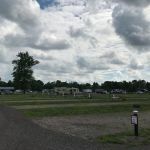 One note: The lakefront sites are designed for motorhomes to face the water - not for trailers - with the utilities on the "opposite" side of the site. We camped at Harbor Cove RV Resort in a Fifth Wheel. The park is in a light industrial area with occasional train noise but very convenient to Coldwater which has a nice downtown area, an amazing restored theater and some beautiful old homes. As per prior reviews, brand new park. Not ready for prime time. We stayed just an over-nite, were given site near gate. Best sites clearly those near water. Roads & sites are gravel, sites reasonably level, close together but enough room for slides and awning. We had to carry a picnic table from an empty site to ours, very few sites had tables. WiFi did not work, no cable TV, minimal grass/weeds, small (3-4') trees planted will be nice in several years. This park will be VERY nice when it matures, but right now, other than lake lots, it's a gravel parking lot with full hook-ups. We camped at Harbor Cove RV Resort in a Motorhome. Suggest you be self-contained, no fuel or food sources seen near-by. This is a new park and I would have rated it a 10 except for drainage. It did rain very hard and the gravel pads had standing water on them. Other than that this is well worth a visit. We camped at Harbor Cove RV Resort in a Motorhome. Brand new park, very nicely laid out, very clean. Staff is very friendly and helpful. Sites are crushed rock and level and big. The view over the lakes is beautiful . We used it as a stopover for one night to northern MI. When the park is complete it will be a top park. We camped at Harbor Cove RV Resort in a Motorhome. The restaurant in the neighborhood Bills SteakHouse was fantastic and very reasonably priced. Are you affiliated with Harbor Cove RV Resort ?